Day 3 prelims of Big Tens will include the 100 fly, 400 IM, 200 free, 100 breast, and 100 back. 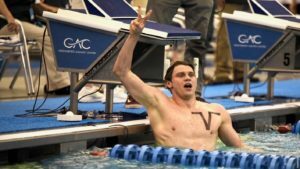 Today we’ll get to see NCAA record holder Ian Finnerty swim his best event, the 100 breast, where he holds the meet record in 50.72. Charlie Swanson, the leading 400 IM’er in the NCAA this season, will be leading the 400 IM charge today, where Michigan has the top 4 seeds. 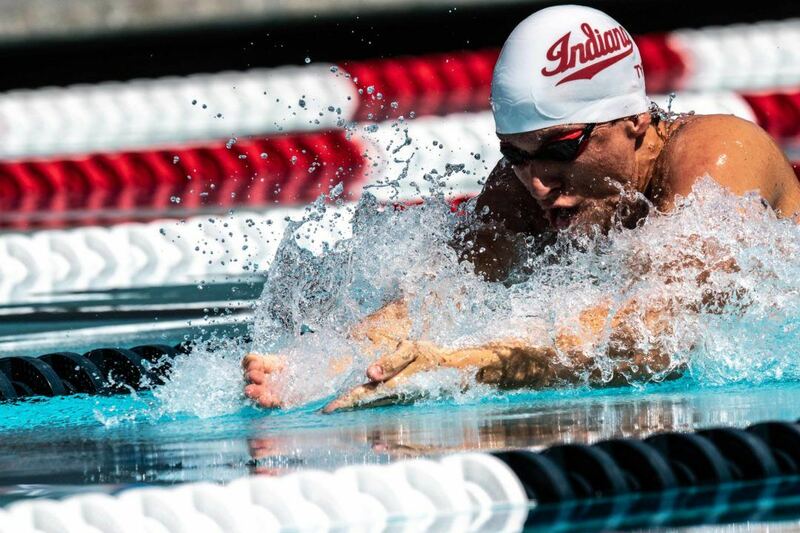 Bruno Blaskovic dropped a whopping 5.3 seconds from his 50.6 seed, grabbing the top seed for tonight, and leading the charge for IU, which earned 4 swimmers to the A final tonight. Blaskovic was quick off the start, turning in a 20.99 split on the first 50, which only Ohio State’s Noah Lense was faster than (20.87). Ohio State had their best individual performance yet, in terms of A finalists, clocking a total of 3 for tonight. Vini Lanza is the prohibitive favorite for tonight, despite his 6th place showing this morning. Lanza has a best time of 44.50, and is the defending Big Ten champ, winning the event with a 44.79 last year. Andrew Mering’s estimated NCAA cut for the 100 fly this year is 45.86, meaning the top 7 this morning have an excellent shot at receiving an invite. 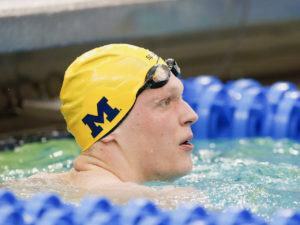 It was Michigan’s turn to return 4 swimmers to the A final tonight, led by Ricardo Vargas. Vargas got his hand on the wall first this morning, thanks in part to a 51.52 on the free leg of the race. 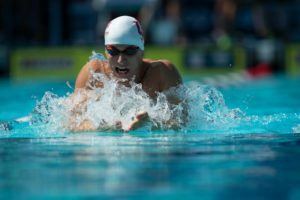 Top seed and NCAA leader this season, Charlie Swanson, came in 4th, swimming over 4 seconds slower than his season best of 3:39. Thomas Cope (3rd) and Will Roberts (6th) were Michigan’s 2 other returners to the A final tonight. Penn State had a strong showing, Michael Daly and Hayden Harlow each made it into the top 8, 2nd and 8th respectively. 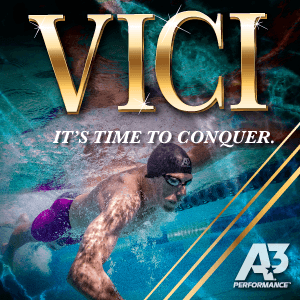 Our projected invite time for NCAAs this year is 3:43.81, so most of these swimmers will have to go faster tonight if they want to feel safe about earning an invite. Zach Apple, the 3rd place finisher from last year’s NCAAs in this event, took the top seed for tonight, psoting a season best 1:33.21. His lifetime best sits at 1:31.18 from NCAAs last year. Ohio State picked up the next 2 seeds for tonight, with Paul Delakis and Andrew Loy coming in 2nd and 3rd respectively. DeLakis swam a season best by 3.25 seconds, and while Loy did swim faster than his seed time of 1:35.95, he led OSU’s 800 free relay off in 1:32.75 on night 1. Given that, there should be a really exciting race tonight, since Mohamed Samy, the 4th place finisher, has already been 1:32 this season, and Felix Auboeck, the 5th place finisher, had a very quick 500 last night. Our estimated NCAA cut in the 200 free is 1:34.06, which the top 5 achieved, and Patrick Callan has already been under this season. Ian Finnerty wasted no time putting up a fast time this morning, breaking his own meet record of 50.72 from last year. Finnerty posted the fastest 1st 50 (23.73) and 2nd 50 (26.87) splits in the field, earning the top seed for tonight by .79 seconds. IU got two others, Zane Backes and Gary Kostbade, into the A final, matching Michigan, who also had 3 advance. Max McHugh gave Minnesota it’s first A finalist of the day, turning a a 51.39 for the 2nd fastest time in the field by far. Also of note, every single swimmer who made the A final went a season best this morning. Purdue’s Trent Pellini came in 3rd with a 51.85, just .12 seconds off the NCAA A cut. 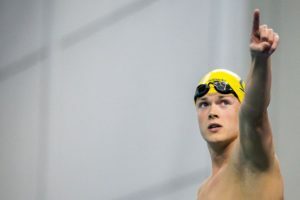 That’s important for Purdue, because if he gets the cut tonight, Purdue will have an individual and a relay A cut, allowing them to swim all their relays with B cuts at NCAAs. The projected NCAA invite time in the 100 breast is 52.62, so the top 7 have cleared that so far. Gabriel Fantoni made his 2nd A final of the day, qualifying 1st in the 100 back with a season best 45.46 after qualifying 5th in the 100 fly. Along with Fantoni, Henrique Painhas and Mohamed Samy each qualified to their 2nd A finals of the day as well. Painhas also made the 100 fly, and Samy the 200 free. Fantoni leads the way as the only swimmer in the field this morning to have been under our projected NCAA invite time of 46.08. Fantoni will surely make the meet with his time this morning, but it’s unlikely anyone else in the field did enough this morning to make it. Fantoni was by far the fastest swimmer on the first 50, clocking a 21.65. IU just had 4 fliers go under 46! Wasn’t expecting that! All the conference meets seem to be crazy fast this year. Just looking at ACC and Big 10, it took under a 46 in the 100 fly to make it in the top 8. If you have one individual swimmer invited to NCAA’s, and have an A cut on a relay, all of the B relays can swim too? Yep. So Purdue is in.